Subpopulations across the range have declined substantially. Dramatic declines have been recorded at Kaapsehoop, all subpopulations in Limpopo province are now extinct, and the subpopulation on Mariepskop is virtually extinct. Where it has been monitored, decline has exceeded 80%. 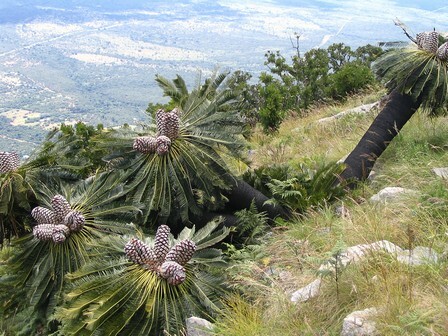 All subpopulations are also affected by a fusarium fungus that attacks the cones so that no viable seeds are produced. Restricted to high mountain peaks in eastern Mpumalanga and parts of Swaziland. 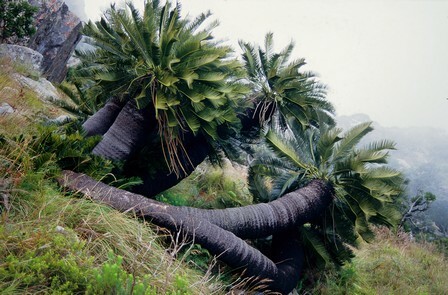 Locally extinct in Limpopo, KwaZulu-Natal and Pondoland. Steep, rocky slopes in mistbelt grassland, 1300-1500 m.
Signs of stem harvesting for traditional medicine have been observed. Some evidence of plant pathogens have been reported. 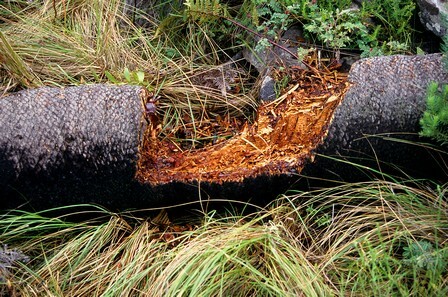 In addition, E. laevifolius is threatened due to habitat loss caused by alien invasive plants and timber plantations. This species has also been drastically affected by over-collecting for ornamental purposes. All populations are also affected by a fusarium fungus that attacks the cones so that no viable seeds are produced. 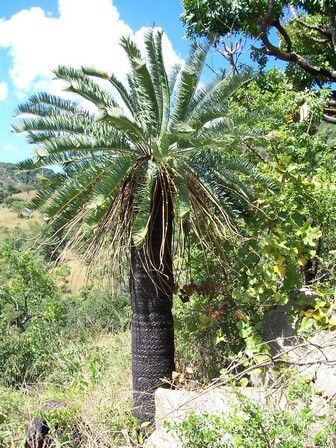 This formerly widespread cycad has declined extensively across its range, and it is now locally extinct in Limpopo and KwaZulu-Natal and the Eastern Cape. Over 80% declines have been recorded in monitored subpopulations. It is estimated that only between 700 and 820 mature individuals remain in a few scattered localities in Mpumalanga and Swaziland. 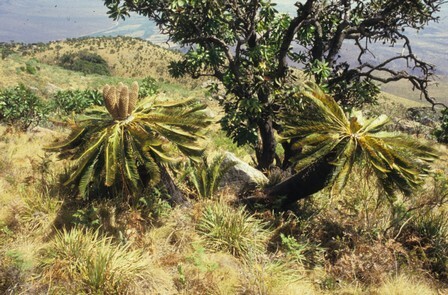 Plants occur in four nature reserves in Mpumalanga an Swaziland. Donaldson, J.S. 2003. 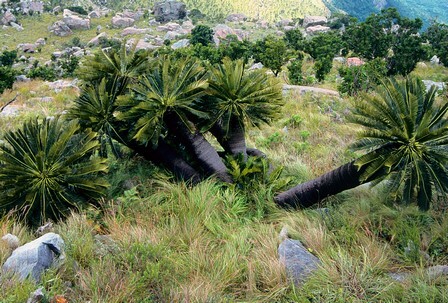 Cycads. Status survey and conservation action plan. IUCN/SSC Cycad Specialist Group, Gland, Switzerland; Cambridge, UK. Emery, A.J., Lötter, M. and Williamson, S.D. 2002. Determining the conservation value of land in Mpumalanga. Report to the Department of Water Affairs and Forestry, South Africa. Grobbelaar, N. 2003. Cycads. With special reference to the southern African species. (2nd ed.). Nat Grobbelaar, Pretoria. Osborne, R. 1989. Focus on Encephalartos laevifolius. Encephalartos 19:2-8.